Here I am, a few days out from the Mohican 100 Mountain Bike Race. It has been 2 and a half months since the True Grit Epic Mountain Bike Race and I am not 100% sure at where I stand. I backed off of riding quite a bit this spring. I had been riding and racing quite a bit all winter and was feeling like it was time to give the body a little rest before I hit a string of 100 mile races over the summer. Plus, I have a variety of projects that I am working on and time has been a bit of a constraint. At any rate, the Mohican 100 is really the start of my summer races and string of 100 milers. I’ll be doing a 100 miler every 2 to 4 weeks. You’ll have plenty of race reports coming your way this summer. As I mentioned, I have been quite busy working on various things this spring. You’ll see some of those things coming out on this website, such as workout plans and eventually training schedules. I realized something last fall and early this past winter as I made an attempt to train at a very high and aggressive level… There is a pretty tough balance there and even if I could fit in the training hours, I didn’t have the time to really rest and recover between the training hours. I eventually would end up sick and spend a week or 2 recovering and in the end, I actually think I went backwards a little. I basically started breaking down during that period and wasn’t rebuilding properly. I had to take a step back and really analyze the time I had, where my biggest weaknesses were and I how I could make the most of that time. That brings me full circle and leads me to a few different thoughts… When I started this whole thing, it was about the adventure, challenging myself and testing the limits of what I could handle. I guess, what gets me geeked up the most is the stories of the everyday guy like myself, with a family or not, but you know who I am talking about. The guy or gal that is trying to squeeze in a few rides a week between work and other commitments. They may have a typical day job or someone like me that is doing a balancing act of a variety of things, freelancing, my own projects and starting my own business. Either way, even if you could train like a pro, you couldn’t recover like a pro and are probably trying to fit meals in on the go. I have did a lot of thinking and trying some different things and am pretty passionate about making the most out of the training time that I do have. I can’t get to a trail all the time as it is a 35 minute drive to the nearest trail and 50+ minutes to the next nearest trail. When it comes to the road, I am getting more and more nervous about getting out on the road and have even put my road bike back up on the trainer, despite summer being in full swing. 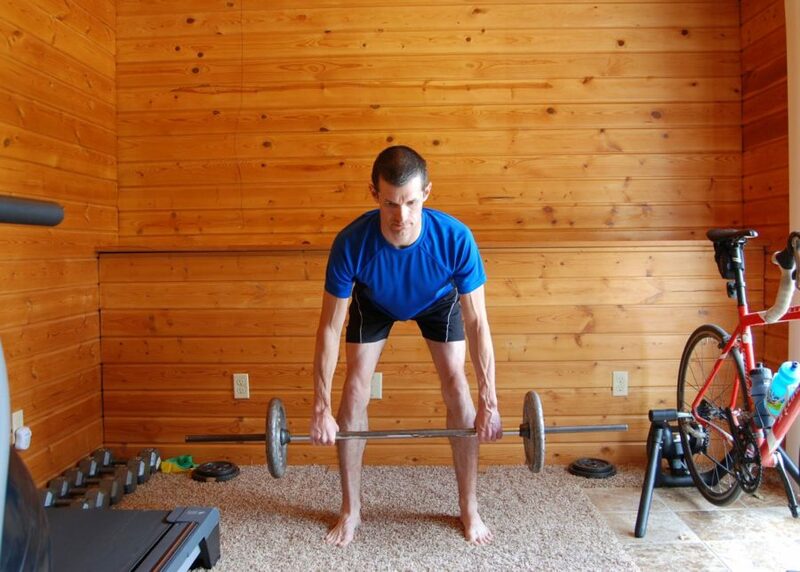 When it comes to strength training… I badly neglected this last year and opted for time on the bike. This was good for my hill climbing abilities and legs, because I did visibly put muscle on my legs last year. However, I completely trashed my upper body and shoulders. I was starting to have a lot of pain in my shoulders and couldn’t even get full mobility out of them. My lower back and neck were also taking a beating. Everything was breaking down. I had to take a step back and do something different. I have also been thinking back to a lot of the training and riding that I did 1 to 2 years ago that really made a big impact on my fitness and abilities on my bike. You’ll also start seeing a lot of this stuff come out from me in the coming months. I guess what I am saying is that my biggest gains did not come from the short stint of a couple months of going all in. That was interesting to see what worked, what didn’t and how my body responded to certain workouts and training loads, but when I look back… I made some pretty massive gains a year or 2 ago with just a few rides a week. I also had some good gains out of what I’ll call mini cram training camps; 2 to 3 back to back days of hard riding and hill climbing followed up by a few days of recovery. That being said, I get that I was really early in my cycling condition, so just about anything was going to make massive gains. However, I think there is something there when it comes to getting the max amount of benefits out of the minimal amount of work or cramming riding into whatever available time you have. I hear a lot about the minimal effective dose out on the web today. There are 2 sides to this conversation though. You can make it work and I have proved that. It won’t get you to the top, but it will get you to some pretty decent results. The problem is the recovery from those big races or events. You can get away with the minimum and do fairly well, but you’ll most likely fight some heavy cramping and some long recovery after races. Your muscles never get the chance to adapt to the extended fatigue and long repetitive loads. You can get through the race and perform, but it will hurt and you will pay for it. You will have to dig deep and it will be tough to stack a bunch of races together as well. I am still working this all out and looking back at my historical training, so I will have to circle back on it in a future post. I thought it was worth bringing up though. I guess where I stand on it right now is this… If you can get some type of period in for a month or 2 of just getting some miles in and getting the legs used to the motion, fatigue and time on the bike… then you can later change the training to less training and higher intensity. Like I said, I need to spend some more time on it, reviewing my previous ride data to come to full conclusion on it. Where I am going though, is that there is hope for us folks that don’t have time to train like a pro, as long as we are a bit methodical about it. We might not get to the podium, but we’ll eventually be able to hold our own and it will probably take additional time, as in a couple years to get our bodies fully adapted. Anyways, back to where I am at today for the Mohican 100… I feel much better about it now than I did a few weeks ago. Even though I haven’t gotten the miles in that I would like to, I have been fairly purposeful about most of the miles I have put in. I’ve made sure to stress the heart once per week to keep the heart muscles loose. In contrast, I also think it is important to get out and spin at a really easy pace once per week and I’ll do this with the kids, on my trainer or down the gravel road. The other thing that I think is great for muscular endurance of not only your legs, but also your core and upper body is to go out and ride a good sub-threshold distance ride on trails once per week. Keep the core and upper body adapt to handling the bike. That is what I would do if I could only ride 3 days per week, which is close to what I have been doing. I did fit in an overnight training trip to Cuyuna as well. I guess I would call that a mini cram training camp, much like cramming for an exam in college. I think you can get a lot out of it, if done right. I rode for an afternoon, recovered for a couple hours, rode in the evening, slept and rode again in the morning. It was a lot of miles in a short period, but I had some recovery between them to keep the legs just fresh enough to hammer again a few hours later. Then I ate right and recovered for a couple days. I did some riding like this last year with a Cuyuna trip, a trip in the Keweenaw and another to Marquette that did wonders for me. I think if done right, you can get a lot out of it, which is why I did the overnight Cuyuna trip a few weeks ago. I did make an effort to spend some time on single track for the few rides I could get in this spring as I desperatly needed to improve my singletrack skills. I still have a lot of work to do in this area, but I did make some gains. This was part of my reason for my mini trip to Cuyuna. I could get 30 miles of singletrack in with very little repeated sections of trail. My theory was that I could go ride laps at my local trail, but I needed to work on flowing through singletrack that was new to me for the most part, since most of my racing is on unfamiliar trail. Plus Cuyuna has a little bit of elevation to it for a well rounded workout. Back to the Mohican 100… The biggest thing I have going against me here is the rollout over some steep climbs right off the bat. I have a hard time holding myself back and probably have a really good opportunity to blow myself up here if I am not careful. I like to test myself to see how well and how long I can hang toward the front. Although I am stronger on climbs now than I was this time last year, I could still get myself in trouble here. That being said, there are many things that I do have going for me at the Mohican 100. I am stronger on climbs this year, I am better on rock gardens and flowing through singletrack and if I can survive the rollout without blowing up; I might be able to stay on pace in the singletrack while getting some recovery in before hitting the gravel roads on the back end of the course. I hear there are some really steep climbs in the gravel and I do have a knack for grinding out climbs and miles while still in deep depths of pain. Not saying this is going to make me competitive at the front of field or anything, but I am expecting to place higher up the field than I did at True Grit. When it comes to race nutrition; I am trying out some new stuff for the Mohican 100. I blew myself up at True Grit and gels weren’t working for me. I also struggled with gels getting me thru fat bike races this winter. What got me out of the hole at True Grit was a couple handfuls of Jelly Belly Sport Beans and then a couple hand up bottles of Carbo Rocket from the aid stations helped keep out of the hole. My main nutrition plan for the Mohican 100 will be a mix of Carbo Rocket and Jelly Belly Extreme Sport Beans. I’ll also throw in a couple Honey Stinger Energy Bars in my jersey in case I need something else. I plan to mix the Carbo Rocket at a 2/3 serving mixture to leave some room each hour for 100 calories of solid food. That solid food will mostly be a packet of the Sport Beans. I have a 100oz hydration pack and plan to use that for the Carbo Rocket. I will keep a large water bottle on the bike of plain water to wash down the Sport Beans. I am hoping that I can get through the race with only 1 refill of my hydration pack and water bottle around the halfway point. I plan to carry a ziplock bag of my round 2 Carbo Rocket in my hydration pack storage. I don’t actually plan to use any drop bags at this point. I thought about premixing additional hydration packs for drop bags and then just swapping, but I’d like to see if this works out and that way I am not locked into specific aid stations. If this works, I will only have to stop once. I am usually better if I keep moving anyways. As far as general daily nutrition goes… I have been experimenting lately with eating very little carbs or at least very few carbs from grains and pretty much zero carbs from processed foods. My diet the last few weeks has mainly consisted of meat, vegetables and dairy. I am not sure where eggs fall in there, but I eat eggs for breakfast every day. Dinners have been chicken, brat or hamburger with vegetables. I don’t use a bun or bread with any of it. Lunch was usually the same as dinner, but have been trying to switch that to raw vegetables in the version of a salad. My gut in general seems to feel healthier, aside from having a hard time with raw vegetables. I can’t forget the few beers scattered in there over memorial weekend either. My carbs have mostly been coming from complex carbohydrates in the vegetables. I have been reading up a lot about fat burning diets, but in general; I am more interested in cutting all the crappy processed foods out of my diet. I am convinced that a lot of the processed foods are not really actually food. It is a mix of preservatives, fillers and chemicals to make something that taste good and looks like food, but really has no nutritional value at all. More to come on this one for sure throughout the year. I have not had more than a ride or 2 to that was long enough to see how it effects me on the bike, while hydrating with the Carbo Rocket and Sport Beans. So we will see how this diet change of mine works out for me come race day. All I can say is that it can’t be worse than what was going on previously. I started looking back at my diet a year or 2 ago when I felt better and it turns out that it was pretty similar. I was still in my progression of improving my health and fitness and when I look back, my diet was pretty low on the process foods on a daily basis. Like I said earlier, I have been giving a good review to things that have worked well and have not worked well for me in the past and trying to perfect them. Probably about time I wrap this up as I need to get my stuff packed up for the race. 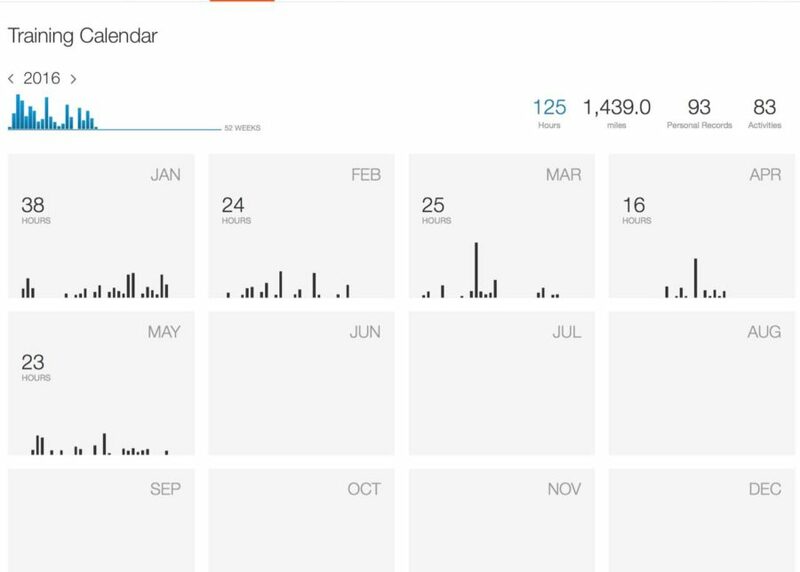 Here is a break down of my training since January… I pulled it straight from Strava. There are a few runs scattered in there as well, but nothing major. They included a few sprint interval workouts, some light jogging and a 5k run to baseline where I was at. I do plan to fit a foot race or 2 in somewhere this year if I can find the time. Depending on how I feel after the Mohican 100, I might even try a 5k over in St. Croix Falls. That is if I can fit it in the family schedule, let alone be recovered enough to race it. At any rate, this blog has been a great way for me to document my races, training, nutrition and whatever other thoughts come into my head. Hopefully somebody else out there finds it all useful as well. Always feel free to reach out to me with questions about anything I am trying out or working on. I really enjoy getting e-mails from readers about any of this and it has been fun making connections and running into some of you at races. Thanks for reading. Maybe I’ll see you at Mohican this weekend. If not, enjoy whatever you have going on and look for my Mohican 100 race report next week.